Watching paint dry may be famously boring, but putting on a fresh coat can bring a dull space to life. 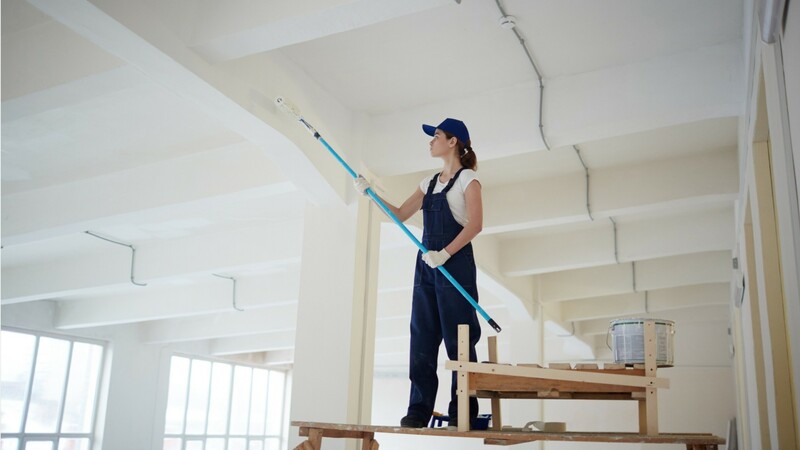 Painters apply paint and stain to bring a new look and weather protection to surfaces of homes, buildings, and other structures. Painters uncover the original surface, and even out any imperfections before applying primer or sealant. To protect adjacent surfaces, they tape off, or cover them with tarps. Only after careful preparation do they paint— using hand brushes, rollers, or sprayers. Industrial painters work on bridges, oil rigs, and tall buildings. They may operate sand blasters to remove old coatings, and work from scaffolding, or suspended by cables from harnesses. Artisan painters use special techniques to create unique finishes. Helpers haul materials and tools, clean work areas and equipment, and perform other basic tasks as assigned. Painters typically work both indoors and outdoors, spending the day climbing, bending, kneeling, and reaching. They have one of the highest rates of injuries and illnesses of all occupations. Falls from ladders, muscle strains from lifting, and exposure to irritants such as drywall dust are common risks. Protective eyewear and clothing is worn when needed. Most painters work full time, and many are self-employed. There is no education requirement and most painters learn on the job. Some learn the trade through a 3- or 4-year apprenticeship that combines paid work experience with more formal training. See more details at O*NET OnLine about helpers--painters, paperhangers, plasterers, and stucco masons. Helpers--Painters, Paperhangers, Plasterers, & Stucco Masons by U.S. Department of Labor, Employment and Training Administration is licensed under a Creative Commons Attribution 4.0 International License.